The Laramie County Board of Commissioners meets in regular session the first and third Tuesdays of each month on the third floor of the Historic Courthouse, 310 W. 19th Street. Meetings begin at 3:30 p.m.
As Clerk to the Board, our office prepares and distributes the meeting agenda and records the minutes of each meeting. The agenda is finalized by noon on the Wednesday preceding the meeting. For information on Board agendas or to request that an item be added to the agenda, please call 633-4266 or write office@laramiecountyclerk.com. 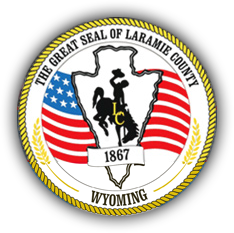 Laramie County seeks to empower its citizens with information through the launch of a program that reinforces the County's commitment to transparency, accountability, and efficient operations. Laramie County aims to improve services through a solution called Granicus. With this new interface, citizens will be able to search resolutions, agendas, documents, and minutes using keywords. Citizens can view and print Commission agendas and minutes and watch both live and archived videos. For copies of Board minutes prior to April 2014, call the Clerk's office at 633-4266 or write office@laramiecountyclerk.com.